I'll continue working on my previous entry. During the last jam I simply didn't have enough time and the result was pretty disappointing to me. I ended up just dropping the project and so I can just pick up where I left off. So far I've done only programming, so there's nothing to show. Got the subtitle system to a state that only breaks sometimes in pretty specific circumstances, I'll leave it at that for now. Also had to make a character controller from scratch, the Unity one was too convoluted and I need to take control of the camera for the cutscenes. It's still very basic but now I can rotate the player's view without weirdly snapping to a position. With these things done, i can start working on the intro sequence. Not sure how to best coordinate it but Unity's timeline feature seems made for it. Time to learn how that works. I really enjoyed the first game, so I am very much looking forward to seeing this one as well! I need these words of encouragement, things have not been going well in the last days. After work I'm often simply not in a state to really do any productive jamming, something I had not really expected. So thing have been going slow as is. But just now I also discovered that the camera control system I have built is actually broken. And then i fixed it. Complaining in Slack has once again worked wonders. I want to use those 'cinematic' bars to show the player when they don't have control. Pretty happy that I made some progress today, despite that rocky start. Well done, very effective at setting the tone. I'm happy that you have a chance to return to this game! Things are still going very slowly, lots of annoying and distracting stuff happening. Making cutscenes is completely new territory to me, so I'm not sure how to quite approach it. Currently all the timing is simply hard-coded in a script but it makes tweaking a bit cumbersome. But it mostly works, so I'll stick with it for the duration of this jam, i think. This weekend I'll focus on making some plants, they will play a very important part in constructing the environment, and I'm still unsure how to best do it. I also need to cut the scope wayyy down. 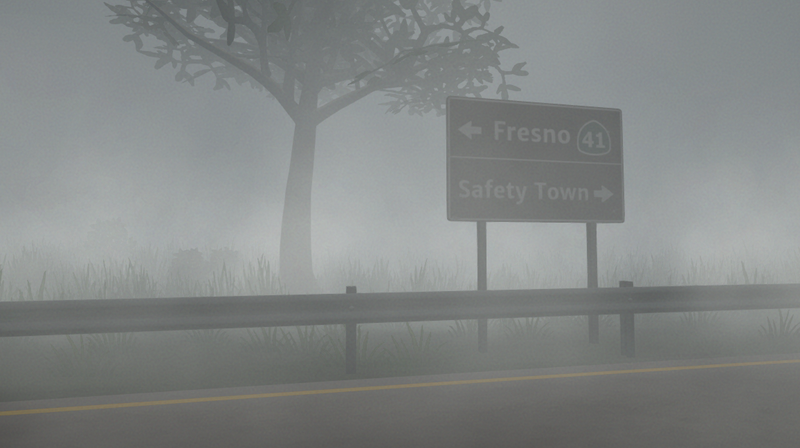 For now I'll focus on getting the intro sequence on the street done and maybe try to build the radio tower location. It could have gone a bit better. This week was absolutely terrible and I didn't get very much done. The car chase is there in structure, now it needs to be bedazzled with graphics and sound effects. I won't get any more than that done this weekend, so my entry will be a 1 minute cutscene with a little bit of interaction. During the week before the showcase I'll probably do some more work on it, but who knows what could happen next? The last two Wizard Jams have been harbingers of doom for me. JoelWmusic in Slack has made some really cool atmospheric music for me, it really improves the atmosphere a lot when just walking through the fog. This was a thing...I did not achieve most of my goals and once again mostly cobbled something together. Other stuff encroaching on my jam time and also just still being a distraction when I did have time was mostly to blame. As always I also overscoped quite a bit. Going for cutscenes without any prior experience wasn't smart either. At first I was using Unity's CharacterController which just completely refused to have its camera controlled. So I made my own, much simpler but still fairly stubborn. 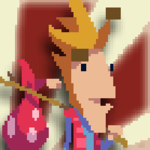 And I didn't want to actually use any proper animations and instead just used lerping between positions/values. It shows, it's all clunky, but ended up at least working. The scripts that coordinate everything are just the worst though. Because the new sequence is so linear I included the old scene so you can also just walk around for a bit and enjoy the creepy music by Joel. This was good! Even if it was short, I liked that you linked up the previous content as well. Very good mood! 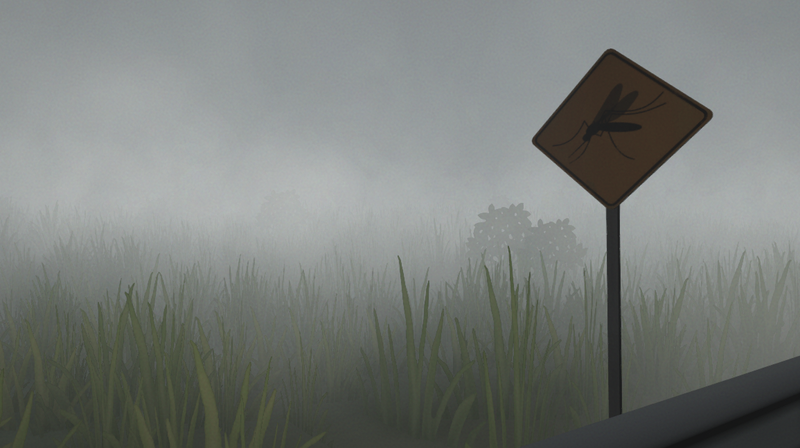 The mosquito sounds and music combine to make a good, scary atmosphere. I also liked the look of the swarm effect when the mosquitos exit the car. This was really cool! Very effective atmosphere and scares (I actually jumped at one point!) and clever use of environmental signposting. Works well as a proof of concept - it's just a shame the player doesn't at least get to run to the satellite tower and lock themselves in the hut, as you had all that in there, but never mind.